The Hobart Town (1804) First Settlers Association Inc. was founded on the 6th March 1974, to commemorate and promote interest in the first and early settlers of Hobart and to facilitate contact between their descendants. In February 1974, a dinner was held to mark the 170th anniversary of the founding of Hobart Town. Mr Richard Lord made the arrangements for this function, which was attended by 103 people. The people at the dinner represented the descendants of the 1804 arrivals including Edward Lord, James Lord, William Gangell, John Clarke, Robert Alomes, Thomas Hayes, William Richardson, Thomas Riley, Mary Kearley and Samuel Wiggins. Several people felt it worthwhile to form an association to compile records , arrange future gatherings and to attempt to locate other early settlers through the media with the aim of promoting awareness of the foundation of Hobart. The inaugural meeting was held at the home of Mr and Mrs Richard Lord and a committee formed on 6th March, 1974. Fourteen interested persons attended and signed the Lords' visitor's book. Mr Richard Lord was chosen to serve as chairman, Mrs Rankin as vice-chairman, Mrs Lillian Watson as secretary and Mr A Gard as treasurer. In 1975 the current Lord Hobart, the 9th Earl of Buckinghamshire, a direct descendant of the Colonial Secretary accepted an invitation to be patron of the Association. 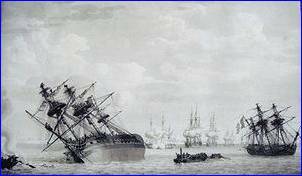 Initially membership was open to those who sailed in a small fleet from Spithead on 24th April 1803, on board either HMS Calcutta [after being stranded on the shoals of Les Palles, 12 April 1809 when in French hands pictured on the right with Régulus in the foreground also aground] or the store ship HMS Ocean. Later the membership was extended to include all those who arrived prior to the colony's change of name from Van Diemens Land to Tasmania. In recent years, associate members and interested people have also been included in the membership. These latter memberships do not entitle the person to vote or to hold an official position within the organisation. Meetings were first held at private houses and then on Monday nights at St. David's parish rooms, 125 Macquarie Street, Hobart, formally the Old Canterbury tea rooms, on Monday nights, but because the cathedral bell ringers practiced on Monday nights, the meetings were moved to the Sunday School room of St. George's, Battery Point. As from the September 2017 meeting the venue was changed to the Moonah Community Centre, 7 Gormanston Road, Moonah, where they are still held at 10 am on the first Tuesday of every month. By the end of 1974 there were 166 members. The chairman's first annual report presented at the annual dinner, 15th February, 1975 at 'Bellevue' Function Centre, Bellerive, stated numbers were down at the dinner due to the unfortunate collapse of the Tasman Bridge therefore, several people cancelled their tickets. Each year on February 20th at 11am the anniversary of the founding of Hobart Town is marked with an Annual Floral Tribute held at the First Settlers' Monument in Hunter Street, Hobart. Representatives of state and local Governments, various churches, armed forces and high profile public servants are invited to join the First Settlers in the laying of garden posies and other flowers. Members of the public are very welcome to join in. Monthly general meetings, usually with a guest speaker, form the backbone of activities of the association and these activities are supplemented by excursions and special events on significant occasions. Our current membership stands at 270 with members from many parts of Australia and some from overseas, all wishing to maintain our shared heritage. Patron's Message from the Rt. Hon The Earl of Buckinghamshire (Lord Miles Hobart).